Guide to Alternative Flours and $avings from Nuts.com! Almond flour is particularly popular with people on gluten-free diets, as it serves almost all of the same uses as wheat flour. It can even be used as a one-to-one replacement for all-purpose flour in baking. Many gluten-free cookbooks feature the flour prominently in their recipes. Compared to other flours, almond flour is especially flavorful, with a nutty taste that works well with many other foods. It produces baked goods that are especially light and moist. It’s also very easy to use, and doesn’t require any sifting or kneading. Even if you’re not on a gluten free or low carb diet, give this unique flour a try and you won’t be disappointed by the nutty flavor, delicate undertones, and the moist yet light baking products that result from its use. It’ll be a refreshing difference from your everyday flours. 1. 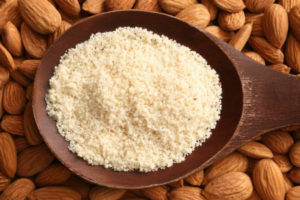 Protein Powerhouse: Almond flour is high in protein (1 serving has 6 grams of protein compared to 5.5 grams in one egg) and low in carbohydrates and sugar. This makes it an attractive option for customers on paleo or low-carb diets. Furthermore, the protein is great for maintaining and building healthy muscles. 2. Heart-Healthy: 64% of the fats found in almonds are monounsaturated fats and according to the American Heart Association, these fats may help lower harmful cholesterol as effectively as expensive pharmaceutical drugs in addition to lowering the risk of heart disease. Click here for more information and recipes using almond flour. Coconut flour is a low-carb, gluten-free baking alternative to wheat flour. It provides a good source of protein and fiber, which makes this healthy flour particularly satisfying. Suitable for many diets, coconut flour creates baked goods with the perfect textures. It can even be added to smoothies and soups for a boost of nutrition. Coconut flour is made from ground-up, dried coconut meat. 4) Scoop, don’t pack. To measure coconut flour, scoop it up with a measuring cup and level it off with a knife. It’s best to avoid packing it into the cup. Click here for more information and recipes using coconut flour. Chickpea flour is finely milled and 100% stone ground from dried chickpeas. Also known as garbanzo flour, this gluten-free baking product can be used as a substitute for wheat flour. Chickpea flour is ideal for making falafel, pancakes, fritters and more. It’s also packed with fiber, protein and iron. Chickpea flour has a creamy and mild nutty taste. It lends a slightly sweet, rich flavor to baked goods and works particularly well with dominant flavors such as chocolate and pumpkin. Baking: Substitute chickpea flour for up to 1/4 of the flour in your baking. It can be substituted for wheat flour or gluten-free flours to increase the protein and fiber content of your baked goods. Egg substitute: For vegans and those with egg allergies, garbanzo bean flour can be used as an egg substitute in baking. Simply whisk 1/4 cup of chickpea flour with a 1/4 cup of water to use as a substitute for 1 egg. Thickener: A lesser known way of using garbanzo bean flour is as a thickener for soups, sauces, and gravies. It has a mild flavor so it won’t overwhelm your dishes. Use it once your recipe is almost finished cooking. Click here for more information and recipes using chickpea flour. Special Offer: Get 4 free gifts when you purchase $25 or more worth of goodies from Nuts.com! If your looking to try these alternative flours or other wholesome foods, we’ve got a great offer! AppforHealth.com has partnered with Nuts.com to give our readers 4 free gifts when they order $25 worth of products or more. Just click on this link to access this special offer. Here you’ll find everything from baking ingredients, to dried fruits, nuts, and even coffee! Don’t miss this opportunity to get your free gifts today!! Love baking with almond flour, never head of chickpea flour!